When Pigs Fly Returns: Hello, Frank! 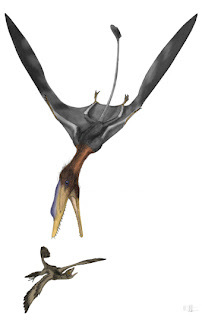 I'll have much more to say on this subject once I finish prepping the art, but for now, ya'll should run over to Tetrapod Zoology, Archosaur Musings, and Mark Witton's site for all the info you could possibly want on this awesome new pterosaur. Oh, it's name? Darwinopterus modularis, a.k.a. Frank! I don't know why Mark Witton is allowed to do anything but draw. I just don't get it. A very interesting pterosaur to be sure! Now if only they'd find a transitional form between pterosaurs and whatever came BEFORE them and couldn't fly... THAT would be the discovery of the century. BTW, thanks for the suggestion on my blog Zach.